The College provides flexible and accessible methods to order and collect College uniform items through online ordering FlexiSchools. For your convenience, you can order College uniforms from your home or office computer. Please click here to order online or download the Flexischools APP. Parents simply register themselves on the Flexischools website and enter their children’s names and classes. The registration process only takes a few minutes and parents can begin placing orders immediately. The Flexischools customer service centre operates from 7:00am to 6:00pm, Monday to Friday -contact Flexischools on 1300 361 769. College uniforms are also available at The School Locker, Maroochydore. In 2019, the College blazer is compulsory for all students in Years 10 and 11 and will be compulsory to be worn to and from school in Terms 2 and 3 as part of the formal uniform. 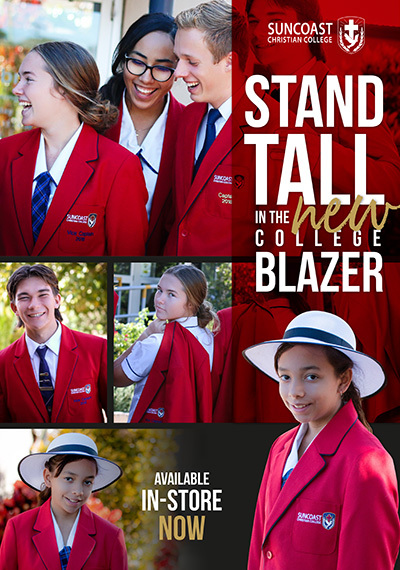 All students in Years 6-9 and Year 12 in 2019 have the option to wear the blazer. The blazer is a comfortable, very smart addition to the uniform that is exceptionally well priced at $165. It has been a long-held desire to add a smart-looking, well-priced blazer to the College uniform range so that our students can look great and feel a greater sense of pride in their school. With the new blazer, our students can stand tall when attending and competing in events with other schools whose students are also wearing blazers.